If I am in charge of doing that for the Israeli Navy, I am going to assume these people are smart and are deliberately trying to provoke a crazy response from my sailors and soldiers that will produce ready-for-television images that both isolate Israel within the international community and further raise the ire of the Arabic-speaking and Islamic worlds. I mean, that is my base assumption for what this group is trying to do. So naturally, the last thing I would want my forces to do would be to overreact, right? It’s like when your convoy gets fired on inside a crowded market: the last thing you want to do is return fire with 7.62mm, killing a bunch of civilians and giving the enemy exactly the effect he was looking for. Posted by thegulfblog.com in Israeli-Palestinian Conflict, Qatar. This is somewhat curious given that Qatar tried on at least two occasions this year to persuade Israel to reopen their trade office in Doha. This will also be the first visit by an Israeli minister since the Hamas assassination debacle in Dubai. Posted by thegulfblog.com in Bahrain, Qatar, Saudi Arabia. Bahrain backed down and has not nominated Muhammed Al Mutawa as the new Secretary General of the GCC. Hid nomination was widely seen as one of the key precipitants of recent problems between Qatar and Bahrain. Qatar strenuously objected to the nomination of Al Mutawa as he was prominent and vocal in advancing Bahrain’s case against Qatar to the ICJ over the border dispute. Although the dispute was resolved some years ago, Qatar could not brook the idea of him as the next Secretary General. Instead Bahrain has nominated Abdul Lateef Bin Rashid Al Zayani. This change came at the behest of Saudi King Abdullah who sought to mediate between the two countries. Given Bahrain’s political and economic position, they are in no position to refuse an request such as this from the Saudi King. There is a growing backlash against Microsoft’s PowerPoint. This slide is a – or perhaps “the” – perfect example of PowerPoint’s problem. 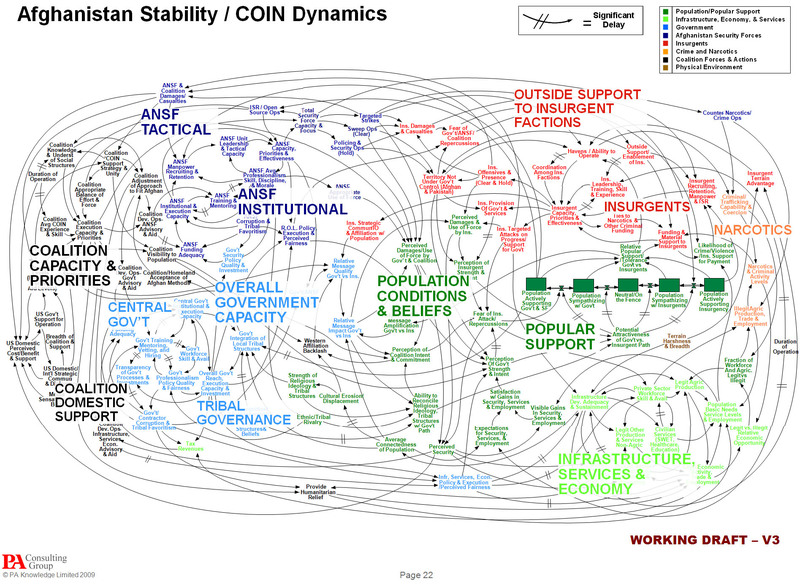 Unless the sole goal of this slide was to highlight that Afghanistan is nigh-on impossibly complex to the point of incomprehension, then this was a terrible slide, for it cannot really be used in any instructional capacity. Various articles in recent years, the NYT highlights, have come out attacking PowerPoint. The NYT article even has quotes from an Army platoon commander in Iraq saying that he – literally – spends “most of his time” making PowerPoint slides. There’s an interesting quick debate on PowerPoint over at Intelligence Squared which neatly and eloquently highlights both sides of the argument. Posted by thegulfblog.com in Al-Jazeera. At least five female presenters of Al Jazeera’s Arabic news have resigned. Numerous reasons are mooted for this (relatively) mass exodus. The most prominent reason (seriously…) appears to be (no, really…) issues relating to their clothes and make-up (honestly…). This could be (and I sincerely hope that this is), however, some kind of ‘muddying of the waters’, so to speak, to camouflage more serious issues. The anchors in question are Julnar Moussa, Jumana Nammour, Lona Ashibl, Lina Zahreddine, Nawfar Ali. Several others are also voicing their support so that number could well rise. The first TV advert offering advice on abortion was aired on Channel 4 on Monday 24th May in England, Scotland and Wales. The advert was ran by a not-for profit advice based organisation on sexual health issues. The regulating body for TV received 350 complaints who were, somehow, “offended”. Saudi ARAMCO have been ordered to pay SR1 million ($266,000) after a prize-winning camel fell into a hole that they had dug. Arabian Business reports that the “heartbroken” owner successfully sued them for not putting a fence around the hole. Hezbollah is running weapons, including surface-to-surface missiles, from secret arms depots in Syria to its bases in Lebanon, according to security sources. Posted by thegulfblog.com in Al-Jazeera, Bahrain, Qatar. Here are the contentious Al Jazeera videos on poverty in Bahrain that some say is the cause of the recent Qatari-Bahraini issues.